"Coen illuminates both the emotional and intellectual lives of her subjects. Climate in Motion pays close and welcome attention to the human experience of trying to understand the global climate . . . . These are hidden, nearly invisible currents, discovered by Coen in almost illegible letters and diaries. But they are a powerful reminder that understanding rarely comes quickly or easily, especially when the mysteries are both larger and smaller than previously imagined." "Conducts a detailed examination of the scientific community of the Austro-Hungarian empire to study its significant contributions to the study of global climatology. . . . Coen provides an excellent, well-researched argument for the beginnings of modern climatology and its ongoing interconnection to the political landscape. . . . Highly recommended." 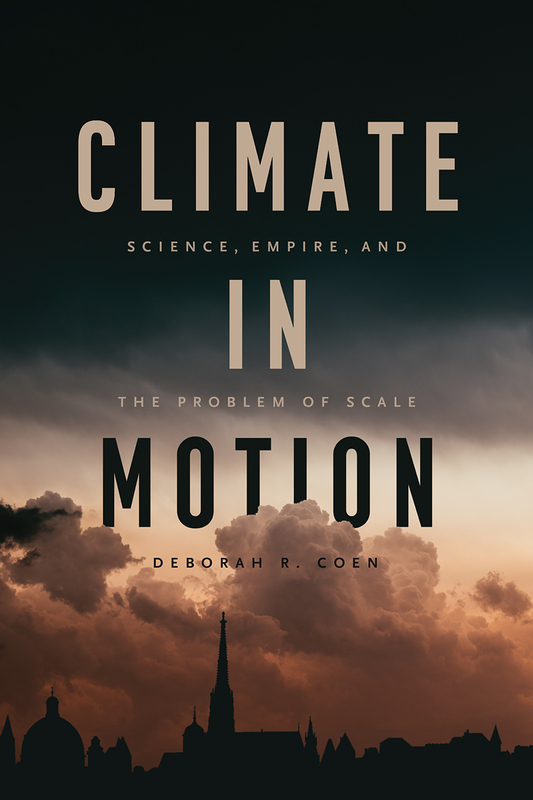 "As the Yale historian Deborah Coen reveals in her inspiring and inventive new book Climate in Motion: Science, Empire, and the Problem of Scale, we owe the foundations of modern climate science to a forgotten cadre of Central European Earth scientists. . . .The Habsburgs needed to transform considerable linguistic and political diversity into a feeling of imperial unity, to make local experience meaningful as part of the whole. The state’s existential challenge was an intellectual quandary for climate scientists such as Kerner and Hann, who spent their careers explaining how and why flowering azaleas and other local phenomena mattered for the planet’s climate in general. In other words, and this is the hinge of Coen’s masterful argument, scaling was a salient political problem no less than a scientific one for the researchers and rulers of Habsburg Europe." "Today, the field of dynamic climatology enables us to understand major interactions across space and time, on scales ranging from the human to the planetary. But where can we find the origins of this crucial approach? In this dazzling piece of historical detective work, Deborah Coen traces it back to researchers such as Julius Hann in Vienna and the practical problems faced by the Habsburg Monarchy in administering its vast and varied territories." "Deborah Coen’s extraordinary, genre-transcending book reinterprets the late Habsburg Empire through the history of its field sciences, especially its inventive, world-leading climatology. Each informed the other’s project of 'scaling': grasping the empire’s dramatic diversity and detail and its largest patterns and circulations simultaneously. Among the most creative and arresting books the history of science has yet produced, this book holds direct and significant lessons for contemporary struggles over climate change and climate knowledge. Coen has written a masterwork." "Coen's book is an inspiring example of what historians could contribute to debates on scalar thinking that the crisis of global warming inevitably provokes. Demonstrating, in deep and delightful detail, how questions of expertise, politics, and aspirations marked not only the lives of pioneering climatologists in the Habsburg monarchy but their science as well, Coen tells a story that beautifully backs up her fundamental argument: that the process of thinking across scales is a learning process and hence open to meaning-making by humans. A remarkable achievement."